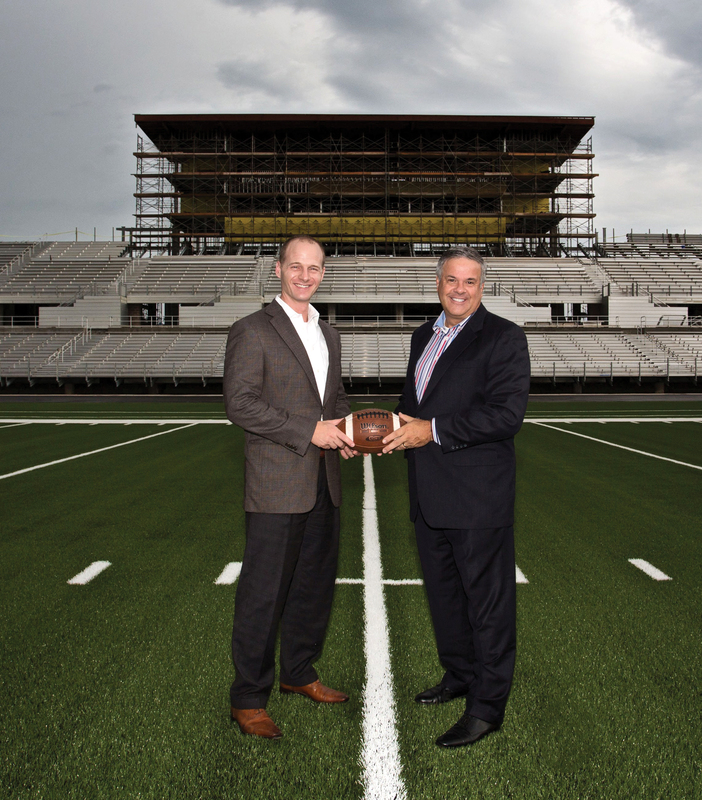 Houston Methodist St. John Hospital CEO Dan Newman, left, gets a look at the new Clear Creek ISD Challenger Columbia Stadium from the 50-yard line with CCISD Superintendent Dr. Greg Smith. The partnership between Houston Methodist St. John Hospital and the Clear Creek School District goes back a long number of years – 26 in fact. So it was no surprise when the school district was looking around for a sponsor for its state-of-the-art video scoreboard at the new CCISD Challenger Columbia Stadium that its long-time partner stepped up to be the Stadium Funding Sponsor. CCISD Trustees finalized the matter at their August meeting when they approved a six-year, $500,000 advertising lease agreement with Houston Methodist, which places the hospital at the Stadium Founding Sponsor level for the district’s newest and much-anticipated facility addition. The stadium, located off West NASA Parkway, is scheduled for completion in late 2015 — somewhat later than originally planned because of record rainfall this spring. Under a separate agreement, Houston Methodist St. John Hospital is also the Official Healthcare Provider for CCISD Athletics. Houston Methodist athletic trainers work alongside coaches and CCISD’s professional and student athletic trainers to strengthen student athletes and better protect them from injury, Smith said. This major sponsorship specifically supports CCISD in the purchase and ongoing operation of the stadium’s state-of-the-art score board and video board intended to enrich the fan experience at the new stadium. The video board and supporting equipment were not purchased through the Bond 2013 program which is funding the construction of the stadium as well as many other district facility rebuilds, CCISD Assistant Communications Director Janice Scott said. “Funding for the video board will be derived from advertising leases by business and industry sponsors. As the Stadium Founding Sponsor, the Houston Methodist brand will be prominently displayed on the video board’s top position panel, as well as on signage in the stadium concourse areas. The sponsor will also be featured in several in-game video promotion features,” she explained. The sponsorship is part of Clear Creek ISD’s ongoing commitment to engage the community in all things education to better provide quality and real-world resources and experiences for students. Students from all five comprehensive high schools, who are enrolled and excel in their campus audio/video classes, will run nearly all of the A/V production activities to support events in CCISD Challenger Columbia Stadium.